Lattakia has been in the news of late. A veritable viper-pit of anti-Assad sentiment, they say. Not so, when I was there. Travel is often interesting in that the things you remember about a place are rarely what you read about in the news or glean from the pages of a Lonely Planet. When I think of Lattakia I don’t think of the ruins of the ancient city of Ugarit or the majestic outcrop of Qala’at Salah-Al-Deen (Saladin’s Castle). I remember only the minutiae. The toothless old man selling sea shells he’d picked up by the shore; sipping thick Arab coffee over backgammon; the pros and cons of competing shawerma stands; Al-Jazeera-televised images of self-immolating Tunisian revolutionaries as seen from inside the local ice cream shop. Fleeting flashes of many things forgotten. But one memory of Lattakia stands out above all. A guesthouse. In Aleppo, my friend Hamud, a former mukhabarat agent-turned-hairdresser-and-hotel-bellboy, had suggested I stay at the “Funduq Salah Ad-Deen” (The Saladin Hotel). Tucked away in a side-alley to the west of Lattakia’s main mosque, the Saladin Hotel backs onto the city square. 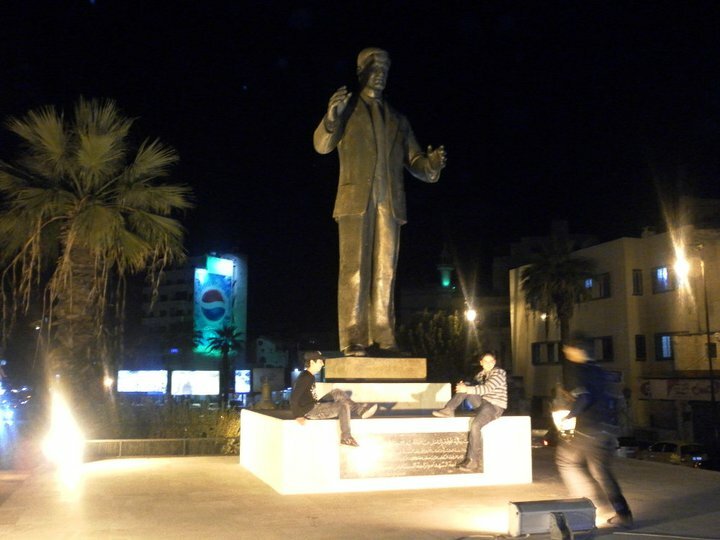 Nearby, a statue of Hafez Al-Assad stands with arms outstretched over the street. A haze of shisha smoke curtains the entrance. From the outside, the Saladin looks acceptable. A typical beyt, lost in the medina. According to reports, a bed also went for the equivalent of $2.50 per night. Definitely affordable. The lobby is a construction site. Part of a grand design, says the owner, showing me his plans for a new Arc de Triomphe in the entrance hall. In its present form, his grand archway is a crumbling brick attempt-at-an-arch, pasted together with odd-job chunks of concrete. The leftover cement clings to the walls in obsequious white bulges – clag on a child’s collage. The owner – “Ahmed. Please call me Ahmed” – shows me upstairs to the guest bedroom – “the luxury twin share”. US$5 per night. The only light in the room is a neon wand. It lies on the floor, ultra-violet blue, like a forensic light at a murder scene. The only other occupant, an obese Turk, is naked in bed. With the sheets up to his pubis, he lies half-swathed in the sickly blue light. Concrete debris covers the floor. Free-flapping electrics dangling from the ceiling – a school of wire-eels scouring the sea-bed for bottom-feeders. I ask to see the dorm. The dorm isn’t so much a room as it is a space – eight beds crammed end-to-end, side-to-side. With no space between each mattress and no overhead storage for luggage, I’ve arrived in the Arab equivalent of a swingers salon – “join the party” – but without the houri. Just the digestive gases of my belching room-mates in here. The other seven men sharing the room seem to be enjoying themselves. An evening of chain-smoking and B-grade Turkish detective shows is ahead of them. Idyllic. I put my head down, feigning sleep. At first, the smoke is bearable. After all, indoor smoke is a fact of life in the Middle East. It doesn’t last though. A few hours in and my cherished air pocket is running out. A toxic grey mist is filling the room. The smog descends. I reach for the curtains. Why that Mediterranean sea-breeze would be pretty welcome right now – if only I could open a window. The window is a dud, of course. A brick wall stares back at me through the glass. On the inside sill, a musty bowl of rotten hummus – mould blossoming at the edges. I slide the curtain shut, roll onto my side, pretend to be somewhere else. $2.50 per night, I remind myself. This entry was posted in Travel by C August Elliott. Bookmark the permalink.